Not everyone’s a “numbers person.” For some, analyzing data is as fear-inducing as public speaking. Lucky for me, today I did both. Florida’s superintendents are leading the nation in using data and technology to address critical education issues. This afternoon I had the privilege of honoring four superintendents for their outstanding use of resources during our third annual District Data Leaders program. Superintendents Alberto Carvalho (Miami-Dade), Dr. Alexis Tibbetts (Okaloosa), Richard Shirley (Sumter) and Dr. Joseph Joyner (St. Johns) were selected as District Data Leader of the Year finalists for establishing information systems to make more informed changes on behalf of students, parents and staff. In the past, district leaders have collected and evaluated data from a variety of areas, including educator effectiveness, parental involvement and community sentiment. 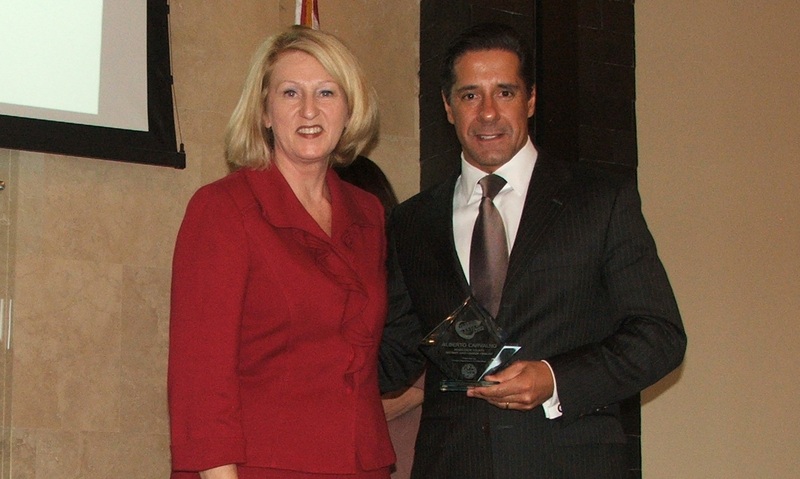 This year’s winner, Superintendent Alberto Carvalho, exemplified the innovative spirit shared by many advocates for data quality. Under Alberto’s leadership, Miami-Dade district leaders put in place a system that monitors student progress over time, giving educators vital information about each individual student’s strengths and weaknesses. Teachers are then able to tailor a plan to put at-risk students back on track. And, in turn, students can reach important milestones at their own pace. We could not have recognized these valuable leaders without the support of the Florida Education Foundation and program sponsors Microsoft, Kyra InfoTech, MetaMetrics and Hotel Duval. Using these data-driven tools, we can better assess and meet the needs of Florida greatest resource, our students. The U.S. Department of Education approved Florida’s request for a flexibility waiver from the Elementary and Secondary Education Act (ESEA). Florida was one of 11 states asking for flexibility with regard to accountability standards mandated by the No Child Left Behind legislation implemented in 2001. The state requested the waiver to be able to move to a single statewide accountability system that would eliminate duplicative regulation and make Florida’s system easier to understand. Florida is one of the first states to implement strong accountability measures for its schools. Overlaying a federal accountability system atop what was already in place and working in our state has proven to be confusing for parents and stakeholders. The flexibility waiver will strengthen the state’s ability to tailor its program to meet Florida’s unique educational needs and better align state and federal accountability systems into one cohesive, easy-to-understand structure. Aligning our resources with our needs will lead to continued performance improvement for all students throughout Florida as we work to increase standards and boost national and international competitiveness. It is important to note, that approval of our request is but one step in a process required to move forward with the flexibility waiver. Commissioner Robinson sat down with members of the Orlando Sentinel Editorial Board to discuss education issues, including teacher evaluations, charter schools and a variety of other topics. Check out the video for footage of the meeting. Florida has long embraced progressive reform efforts in education. We have not shied away from meaningful changes that ultimately prepare our students for what lies ahead in their paths – whether that is a successful career or challenging postsecondary work. This is one of the main reasons for us to apply for the flexibility waiver being offered by the U.S. Department of Education. While we at the Florida Department of Education prepare the application to submit, we are also seeking your input as well. We continue to set high standards and want to align our accountability system with the federal requirements. By doing so, we hope to minimize the confusion that so many of our education stakeholders have expressed with schools that are graded A or B, but not able to show adequate progress according to the federal definitions. Check out the resources at www.fldoe.org/esea and provide your comments through the email address and the online survey. Your feedback will be vital as we refine the framework to help our students further their education.